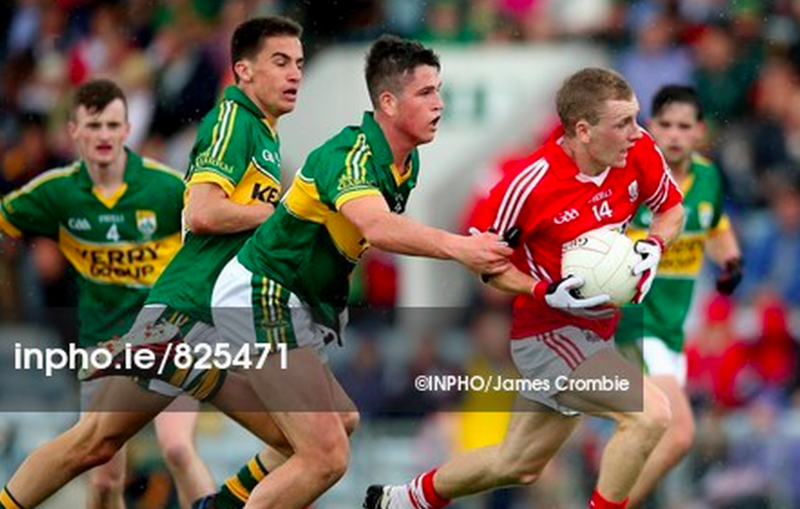 Cork versus Kerry, Meath versus Westmeath… Wicklow versus Carlow… all the auld teams back together again. Kerry remain top of the rankings after their win over Dublin in Killarney, in a game blighted by awful weather and awful indiscipline. That same awful weather also forced the postponement of two matches in Division 2, the home matches of Galway (versus Laois) and Roscommon (versus Meath). Their hiatus meant the winners of the other two matches had a chance to leapfrog either and rise up the rankings, temporarily at least. 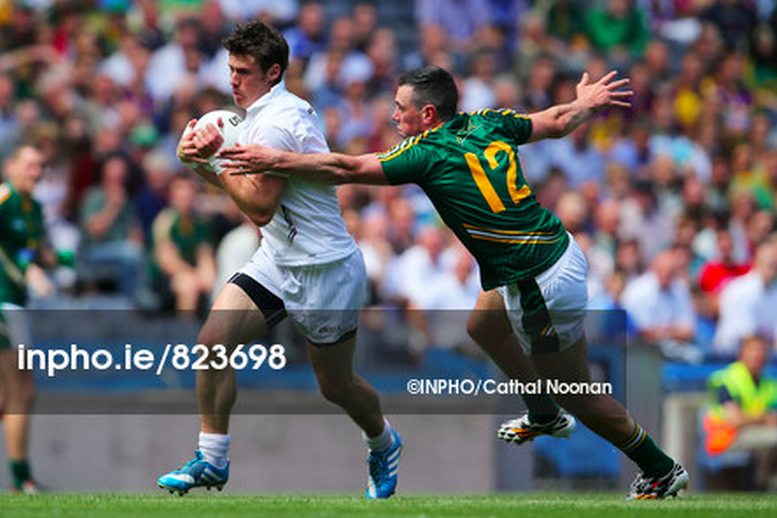 And what’s why Kildare’s loss at home to Westmeath is so damaging. It’s Kildare’s third loss on the bounce, but a loss at home against the lowest-rated team in the Division is even worse. After making it to the O’Byrne Cup final, Jason Ryan’s tenure is looking tough already. A relegation battle looms, and all of a sudden a Leinster opener against Laois (or maybe Carlow) looks like it could be a monumentally important day for football in the county. Kildare’s loss sends them down three spots, with Derry’s Division 1 draw against Tyrone lifting them into 9th. Meath and Galway also benefit from Kildare’s slump, although partly because neither had the opportunity to lose any points this weekend. Their games have been refixed for three weeks’ time. If there’s still snow around by then, we’re in trouble – but given Kildare’s form thus far, other teams may not be so fearful about the sight of white. It’s a double weekend of League action next weekend, with full programmes in football and hurling. We’ll be back twice later in the week with previews of each. 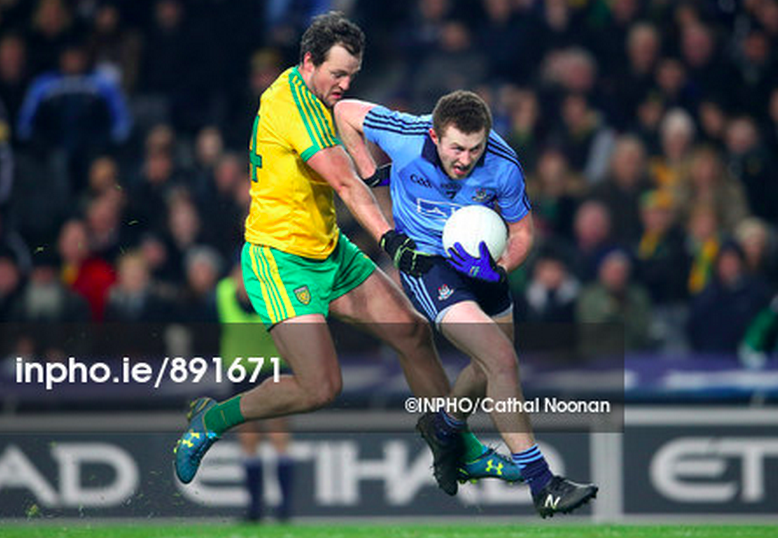 What is it about Dublin versus Kerry? First versus second, in both GAA Elo rankings and All-Ireland titles. Any meeting between the game’s two leading sides is always something to savour – it’s merely a shame that it’ll clash with the Ireland-England match in the Six Nations. Fire up the Sky+. Where else would you start? 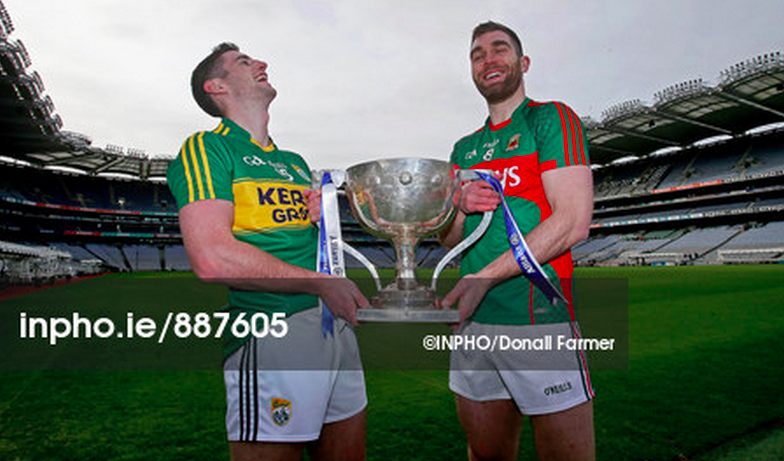 The All-Ireland champions of 2014 versus the reigning League champions and the All-Ireland winners of 2013. Put it simply: if the Dubs can overcome our form-book model that gives them only a 34% chance of success, they’ll overtake Kerry at the top of the table. The Saturday night clash sees Mickey Harte’s rejuvenated Tyrone side hoping to put the opening-night loss to Monaghan further back in their memories. Derry are the division’s weakest side and are given only a 22% chance of success. Another clash between two evenly-matched teams. Cork are the only side in Division 1 to have won both their openers, and if they can escape from Ballybofey with that record intact, they’ll be increasingly difficult to overcome. Our model, however, gives the home side a 69% likelihood of winning. This writer spent last weekend in Castlebar where it seems to have been raining almost constantly since roughly 1997. Last week Dr McHale Park was unplayable for the hurlers and if there’s no improvement this week, we could be in for an odd venue. Either way, one suspects that bumpier terrain might help the visitors to be more competitive than our model suggests – it says Mayo are 81% likely to win. These two provincial rivals are only one spot apart in the ratings, but the rankings gap illustrates something of the difference between them. However, having home venue could help – the model says Cavan have a 52.8% chance of success, which is a virtual 50-50. Galway are another of only six sides in the country with a two-from-two record and are fancied to keep that run going against Laois. Our model says they’re 76% likely to do so. 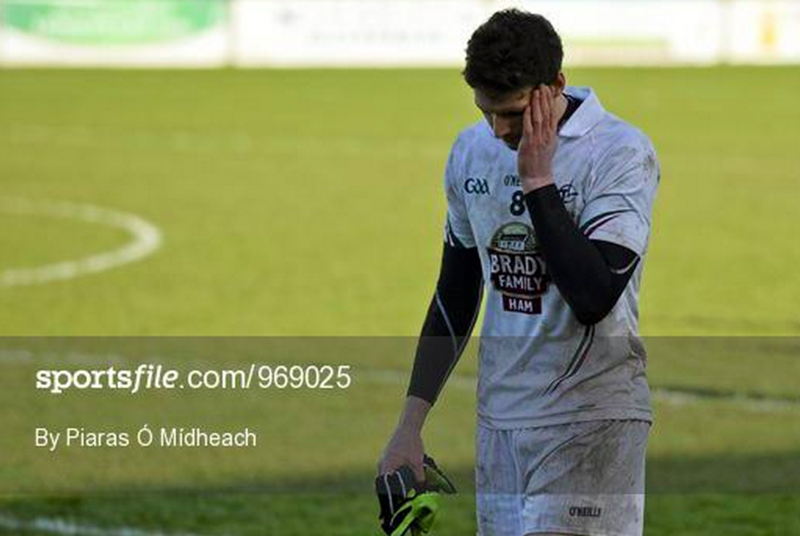 Kildare have lost both of their opening fixtures in Division 2 – and both because of late onslaughts by their victors. Having home venue against a Westmeath may give them a 87% chance of success, but Westmeath won their first game well and only lost to Galway by a single point. An upset would not be out of the question. The Rossies are yet to lose in this year’s campaign (draw versus Cavan, win versus Down) and will fancy themselves to pop a Meath team that, beating Kildare aside, has still to find its feet. Much to your writer’s annoyance, the home side are tipped by 55.8%. The Banner followed their opening-day thrashing of Wexford with a somewhat surprising defeat to Louth – but Sligo have lost both their openers by two points. Clare’s 68.3% likelihood of victory doesn’t seem all that unfair as a result. The hosts are two-from-two, while Tipp will be merely annoyed that their 12-point thrashing of Limerick came ahead of a two-weekend break. Our model says they’re expected to over-come that break with a 53.5% chance. 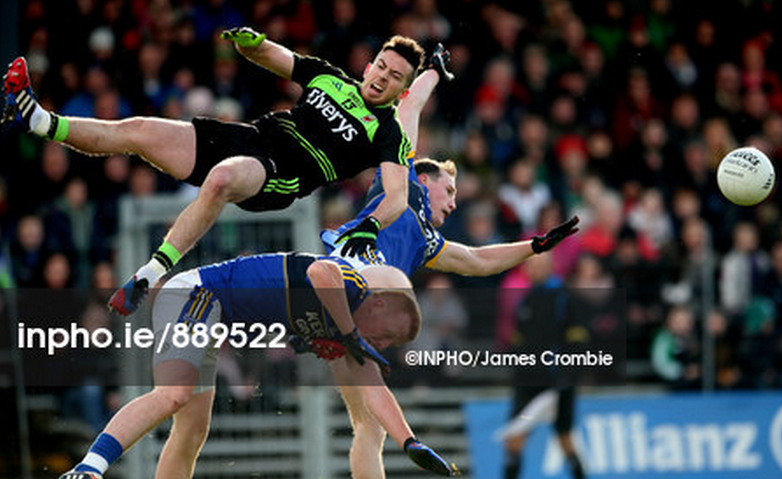 Armagh are two-from-two and this ought to be an easy one – Limerick’s first win over Sligo was followed by a thrashing by Tipperary. Armagh are 85% likely to win it and it would be genuinely stunning if they didn’t. Louth beat Clare who beat Wexford. No problem, surely? If only it were that simple. Nonetheless, Wexford’s thrashing on the opening day has damaged their rating and Louth are tipped by 71%. The Exiles gave Carlow a good game before losing three weeks ago and remaining rooted to the foot of the (32-county) table. Longford drew one match and won the other by a single point – there’s a reason our model gives them a 85% chance of success. Both are one-from-two; Waterford’s ranking is boosted by their 100-point home venue bonus, giving them a 68% probability of coming out on top. The closest-matched sides to face each other this weekend, with only 13 Elo points between them. Wicklow’s home venue is enough to nudge them over the line with a 62.7% likelihood. Leitrim have one point from four and a points difference of -1. Antrim have one point from four and a points difference of… -1. But, again, a tight game may well be settled by a home venue. Leitrim are ruled 59% likely to prevail. We’ll be back after the weekend reflecting on the results of the weekend’s football. Well, talk about false dawns. Of the 13 teams that managed victories in the first round of National Football League fixtures, only six were able to put away a second win this weekend. Cork are the only side in Division 1 with a 100% record after putting away Monaghan by the minimum in Castleblayney, while Westmeath’s failure to score a late free means Galway’s one-point in Mullingar leaves them as the only side in Division 2 with two-from-two. The nature of Elo ratings is that they always reflect the games of the past – and at this time of the year, when the season is still in its embryonic phases and managers are still tinkering with new personnel, it’s entirely understandable for the form guide to be thrown out the window. One can expect further surprises when the squads come back from a three-week spring break. Dublin will go into that break in second spot, after defeating Donegal at HQ on Saturday night, while Tyrone’s morale-boosting win in Mayo also sees them recover some ground. Meath and Fermanagh are the bigger movers of the week, jumping two places, while Down are the week’s biggest losers after the somewhat unexpected defeat to Roscommon in Division 2. Carlow’s win over the dogged Londoners ensures they avoid the drop to 32nd place. Our opening hurling ratings will be here later in the week, along with a preview of the first round of National Hurling League fixtures. The second round of fixtures in the National Football League comes before a three-week break as hurling takes centre stage. That partial loss of momentum makes victory this week all that more important – going into the break with 4 points from 4 is a huge boost in the race for glory; breaking with 0 from 4 is a sign of a long spring and a short summer. This Saturday night fixture is the certain highlight of the Division 1 clashes this weekend – partly because it offers the Dubs a chance of some redemption after last year’s All-Ireland semi-final, but also because these sides are (according to our model, at least) the best-matched teams to collide this weekend. Home venues add a nominal 100 points to each side’s total but in truth the Croke Park factor is worth significantly more to the Dubs, especially under lights on a Saturday night. Even with the 100-point bump, the Elo system gives the Dubs a 63.5% shot at victory. From the sublime to the ridiculous. Derry are by some way the weakest side in Division 1 – and due to the occasional freak result in the league, the hosts here are ranked lower than Armagh, who somehow languish two divisions below them. Despite last week’s slump to Mayo, Kerry are 83% favourites and rightly so. Mickey Harte’s outfit will be looking very uneasy if they go into the three-week recess without a point on the board, but if Mayo repeat last week’s form – against a side much weaker than Kerry last week – there is no reason for them to fear Tyrone. On neutral turf, the model would favour Mayo 80% of the time – in Castlebar, it’s a cushier 86.3%. Not perhaps the most glamorous tie of the weekend, but possibly one of the most evenly matched. Both will fancy their chances after big results last weekend; Monaghan have perhaps slightly less experience facing big guns, but also have the comparative comfort of playing in comfy Castleblayney – giving them a 53% chance of success. Roscommon have been plugging away quietly for a few years and built up a handsome rating – while Down have fallen some way from their modern peak of late 2010. That said, the hosts’ late brace to win in Newbridge last week should give them some bounce. Our model gives them a 69% chance of success. Laois fell to a disappointing defeat against Westmeath last week; Cavan may feel they should have got more than a draw out of Roscommon. Laois would have a 55% chance of success on neutral turf; home advantage ought to ease them past the Cavanmen with a 66.3% chance of a win. For the second week running, Meath are involved in what may statistically be the closest game of the year. But then again, you don’t need a mathematical model to tell you that a league derby between the Two Best Sides In Leinster (That Aren’t Dublin, Obviously) is a perfect Petri dish to test the waters for a summer swim – especially when both sides will be eager to make amends for defeats last Sunday. Saturday evening’s setting of Páirc Tailteann gives Meath a 51.5% chance. A draw would be far from unexpected. Both of the outfits in Maroon enjoyed solid wins last weekend – meaning a win this Sunday would put both in good stead to return to Division 1, where both would feel they may belong. Galway will rightfully feel more confident, however – they have a 65% chance of success, which would be 75% if the game were outside Mullingar. A tale of two fixtures. Tipperary had Armagh on the ropes before falling at the last; Limerick left it late to shake off Sligo. Sadly our Elo system can recognise only what happened, and not what might have been – meaning, with the extra benefit of home comfort, Tipp are 80% favourites. The Wee County, freshly demoted from Division 2, will be eager to make amends after last week’s dismantling by Fermanagh; Clare obliterated Wexford in their first outing after promotion from Division 4. Louth will be desperate to make amends and are 68.8% favourites to do so. Just as with the last fixture, if the form book is usurped, a new order will quickly be emerging. A second win for Fermanagh after last week’s thrashing of Louth would be a welcome fillup for Peter McGrath’s charges. Having the game in Markievicz Park, however, gives Sligo a 54.7% chance of overcoming the loss to Limerick last week. Armagh are clear outliers in Division 3 and should easily dispose of their Yellowbellied hosts – and will be hoping that last week’s stuttery win over Tipperary was enough to iron out any early-season kinks. Wexford collapsed to Clare last week and have only a 22% chance of regaining that lost ground. Forget Dublin-Donegal or Meath-Kildare – this is the true grudge match of the weekend, though perhaps an unlikely one. Nobody likes the millstone of being bottom of the (league) pile, but the Championship heroics of 2013 are a distant memory now for the Exiles, who have just a 31% chance of success. But! Hope springs eternal – and if the visitors can win with a couple of points to spare, they will jump to 31st and send their hosts into the unwanted 32nd spot. Offaly took a long time to shake off London last week and will be keen to put up a better performance – this time facing a Waterford side boosted by a win over Wicklow last week. Playing in Tullamore should mean a 73% chance of success for the Faithful, and an early boost for the hosts’ chances of promotion. There may be three spots between these sides in the ranking table, but the Elo ratings show just how narrow the gap is. Home advantage in Fortress Aughrim (in as much as a Division 4 side can have a “fortress”) is the sole reason that Wicklow are favoured with a 63.5% chance of victory. Mayo’s win in Killarney might not be a sign of a corner being turned, in terms of where we may be in September, but the defeat of the last two All-Ireland winners in the opening round of League fixtures certainly plants the seed of hope that the gap between the Haves and the Have Nots could be closed up slightly this year. The Westerners’ defeat of Kerry sees them leapfrog Dublin and Donegal into second place, while Monaghan’s win over Tyrone means they slide up to 6th place. Elsewhere, Down’s late win away in Kildare in Division 2 also sees them jump up two – largely at the expense of Meath who fell to defeat in Galway. Further down the table, Sligo’s two-point defeat in Limerick sees them slide two spots to 23rd. Kerry’s loss narrows the points gap between the top teams (which could have been bridged even further had Mayo won by more) is significantly narrowed; next week’s clash between Dublin and Donegal could have a material impact towards the top of the table. We’ll be back before next weekend with a preview of each game in Round 2 of the football leagues. If you’re curious and want to look back at some of the ratings from the last couple of years, we’ve decided to share the spreadsheets on which all these figures are based. You’ll find the links in the sidebar. A new season. A new league. A new championship. New aspirations and hopes. New managers. New teams. And a new idea. Welcome to the first blog post on GAArankings.net – a new attempt to try and identify exactly where each county lies in the pecking orders of football and hurling, each and every week of the season. We won’t go into too much detail here about the basis for the calculations – there’s a whole separate page you can read if you want to delve into the mathematical nitty-gritty. Likewise, there are About and FAQ pages which might answer any other inquiries you have. The reason we don’t include pre-season competitions like the FBD League and O’Byrne Cups, in case you’re wondering, is because those competitions also involve college teams – and as we don’t intend to rank and rate college sides, it makes no reason to adjust a county team’s rating based on a game against a college team. The top-ranked 32 teams of those 34 are all in action over the opening weekend – and there’s plenty of scope for teams to hop up and down those ratings as the League progresses. Our intention is to post twice (or four times) a week here – once recapping each weekend’s results in each code, and once previewing the following weekend’s games and the potential changes it might mean to each code. Hurling updates will begin in two weeks when the National Hurling League is about to begin (and, truth be told, we think the hurling rating system has a kink that needs fixing). But for now, we leave you to ponder, argue, inquire, debate, and enjoy. Feel free to comment below, or tweet us @GAArankings (or @gavreilly) with your gripes, questions, observations and craic. And let the games begin.